"When I'm transported back here, I'm in my early 20s again," said Dr. Terre Allen, sitting in LSU's Shaver Theatre, in the Music and Dramatic Arts building. "The countless hours I spent on this stage and in this building!" remembered Scott Allen. "My heart and soul is left somewhere in here." Scott and Terre met as dance partners for the opening number of Louisiana Tech University's production of Grease. The couple moved to Baton Rouge for graduate studies at LSU, where Scott earned his Master of Fine Arts in theater, and Terre earned her master's and PhD in communication studies. Now, the Allens are both professors at California State University, Long Beach. They credit LSU for establishing their "professional identity." "I had such a rare opportunity to have women leaders who were such incredible mentors and role models," Terre shared, listing Gresdna Doty, Mary Frances HopKins and Renee Edwards. "Our LSU experience was made exceptional by our connections to great role models and mentors." "It really feels like a family," Scott said. "We all miss our days at LSU. No matter where life's journeys take us, this was 'home away from home' for many. This is college, where you grow up, where you meet the loves of your life, personal and academic, and where you learn to be yourself." Scott's grandfather, Oscar K. Allen, the 42nd governor of Louisiana and Allen Hall's namesake, was instrumental in moving LSU to its current campus. The Allens own a bell that Oscar and Huey P. Long used while campaigning. It's in their front yard and rings each time LSU makes a touchdown, a tradition of the Allens' game-day parties. "Everyone in our neighborhood knows when LSU is playing football and when they score," Terre explained. "Lots of friends and neighbors come by. There's jambalaya and gumbo. We've converted lots of California folks into LSU fans." In 2016, the Allens committed a transformational estate gift for the College of Music and Dramatic Arts' Department of Theatre and the preservation of the 1930s-era Allen Hall murals. Terre said she was inspired to give by her colleagues and mentors at CSULB and LSU. 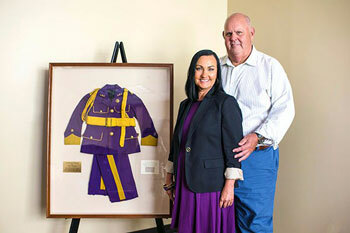 Dr. Terre and Scott Allen with the 1934 Tiger Band uniform replica worn by Asa Allen, Scott's father and the son of Louisiana Governor Oscar K. Allen, as a child. The uniform will be displayed in the new Tiger Band Hall. "I thought, 'I, too, want to make a difference in people's lives. I want to do something that I love and enjoy. I want to be a part of something bigger than me,'" Terre shared, adding, "We thought LSU was the place that was the most impactful on us, as people and as professionals." 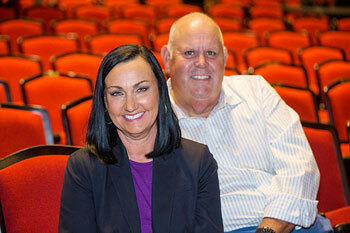 The Allens' gift will allow for unrestricted use by the Department of Theatre. As professionals in higher education, they've learned that unrestricted funds, given their flexibility to meet emerging needs and opportunities, are often the most valuable gifts. "For us, an unrestricted gift means that we're truly giving to the future," Terre said. "The whole idea is that the gift needs to sustain itself over time, and the only way for it to sustain itself over time is for it to be unrestricted." "LSU is a time of our life that we remember so fondly," Scott said. "Through our gift, we hope to inspire others to make contributions to LSU in honor of their fond memories." Graduate student Lance Rasmussen said the gift will do just that: "One of the key features that drew me to the MFA Acting program at LSU was their commitment to having us work with outside professionals as often as possible. I've yet to be involved in a production or workshop here that hasn't allowed me to work with actors, directors and other professionals within my field. The Allens' gift will, in part, serve to help facilitate that sort of connection for a long time into the future." The Allens agree that a full education must include learning an appreciation for the arts. To go without it, Terre calls "educational malpractice." "The whole experience of an LSU football game is a performance. From Mike the Tiger, to the Tiger Band, to the players on the field, to the people in the stands, painting your face and costuming yourself," Terre said. "There's a richness in theater and drama that makes college what it is." To learn how you, like the Allens, can make a difference for future Tigers through a gift in your estate, contact Julie Bolton Falgout, PhD, at jfalgout@lsufoundation.org or 225-578-5846.